Information about the BG14 backstand grinder. The BG14 backstand grinder is a powerful 10HP 3PH unit with a 70 duro 14″ x 3″ contact wheel. This unit has easy setup, easy backstand tracking, easy clean out, vacuum attachment, magnetic switch, parts table, replaceable parts and isolation pads. The BG14 is great for steel foundries, aggressive grinding, descaling, deburring, and finishing. 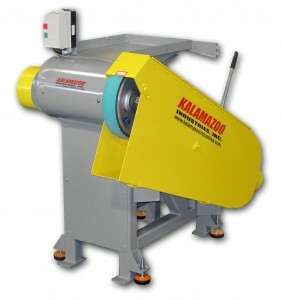 Other size BG14 backstand grinders are available, call for more information today! The BG14 3″ x 132″ backstand grinder has applications in the following industries: Energy, Oil/Natural Gas, Petro/Chemical, Knife Manufacturing, Automotive, Metal Foundries, as well as many other Manufacturing and Fabrication environments. 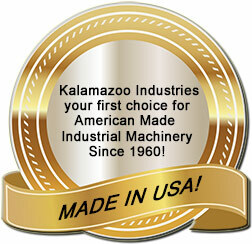 KALAMAZOO INDUSTRIES MADE IN USA! CONTACT KALAMAZOO INDUSTRIES AT (269) 382-2050 OR BY VISITING OUR WEBSITE AT WWW.KALAMAZOOIND.COM TO LOCATE YOUR NEAREST REPRESENTATIVE TODAY! Additional BG14 Backstand Grinder Information! The BG14 backstand grinder is great for grinding gates and risers and other grinding applications that foundries require. 10Hp 3Ph 22o or 440v (please specify at time of order). 14″ x 3″ contact wheel. Options avaliable for BG14: variable speed drive, work table (see below) and other BG14 backstand grinder size units are available.